VATICAN CITY (CNS) — Upholding the sacredness of human life becomes concrete when generations work together to serve everyone: the poor, disabled, orphans, migrants, the unborn and the elderly, Pope Francis said. 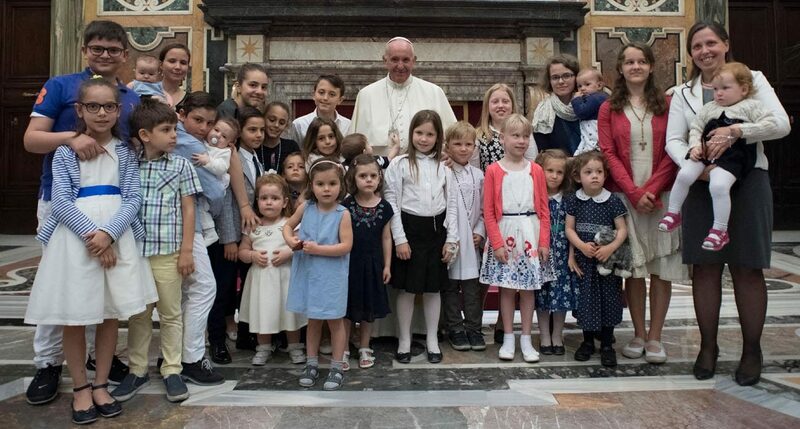 Such work is demanding and complicated, but “only by strengthening your association and inviting other families to join with you, will the task become less arduous, since union makes for strength,” he told members of the Federation of Catholic Family Associations in Europe June 1. The group was holding a meeting in Rome to celebrate its 20th anniversary. The various crises facing Europe — in demographics, immigration, employment, education — “might find positive outcomes precisely in the culture of encounter, if different social, economic and political actors were to join in shaping policies supportive of families,” he said. Pope Francis encouraged the Catholic family groups to stimulate constructive dialogue with these various leaders “without hiding” their Catholic identity. If families are to be the “protagonists” St. John Paul II called for, he said, they must show concern and respect for the dignity of everyone, and they “cannot remain isolated” from others. “Families need to go out from themselves; they need to dialogue and to encounter others” from all generations, he said. He encouraged the group to “develop with creativity new methods and resources” so families could better support the younger generations, accompany others through their difficulties and uphold important values and life’s true meaning.